By Steven Ocallaghan: So last night in the good old US of A, Lamont Peterson successfully defended his IBF light welterweight title against challenger Kendall Holt, stopping him in the 8th round. Now this is what I find remarkable. 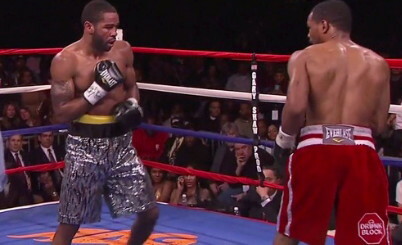 Lamont Peterson scraped a win against Amir Khan to win the title by a 12 round decision in December of 2011. A very debatable win, courtesy of some some controversial calls from referee Joseph Cooper. Cooper deducted 2 points off Khan for pushing but never warned Peterson for coming in head first, burying his head in Khans chest. If points were to be deducted, how can you say one is worse than the other. In the 12th round you could clearly see Khan remonstrate with Cooper about Peterson’s tactics but what does Cooper do, he deducts another point, finally giving Peterson the fight. Leaving aside the unauthorized guy at ringside talking with the judges during the fight then celebrating with the Peterson corner after the result. Peterson was found to be taking PEDS. Cheating. But after all the inquiries, what happens after he is found out to have cheated, it’s alright son you just keep your title, stay out the ring for a while then all will be forgotten. There has been a number of results going against the good. Tim Bradley’s win over Manny Pacquiao, but one that has stuck with me for a long time is the first Lennox Lewis v Evander Holyfield fight that ended in a draw. With Pittsburgh native Eugenia Williams scoring the fight by 2 rounds for Holyfield. Just incredible. She says she saw Holyfield land more punches than Lewis when in fact Lewis out-landed Holyfield by 348-130. Lewis landed more jabs at 137, that’s more punches than Holyfield landed in the whole fight. I know people will say its bias but facts are facts. The point is that Peterson should never have kept the title, a title he didn’t deserve to get and one he wouldn’t have gotten if the referee had done his job properly. Feel free to tell me of any of your own results that you felt thoroughly unfair.